Test method in accordance with: ASTM D4366, DIN 53 157, ISO 1522, SNV 37 112, NFT 30 016. Surface of coating must be smooth and free of disturbances. Coarse pigment agglomerations, poor leveling properties, dust, etc. cause false measurements. 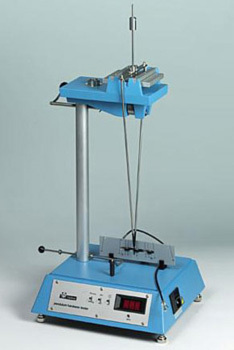 The principle of the pendulum hardness test is based on the fact that the amplitude of oscillations of a pendulum resting on a sample decreases more rapidly the softer the films. The time in seconds (damping time) for the pendulum deflection to slow down to a specific value is taken as the hardness of the coating. The test methods are standardized as per König and Persoz. It should be noted that the NPIRI-A is the same in range and calibration as the Number G-1 NPIRI Production Grindometer and can also be used to check grind and dispersions. Ball Diameter: 5mm/0.2 in. 8mm/0.3 in.